Roughly ten years ago I frequented an environmental philosophy discussion group. Although I felt and looked like an outsider amongst the more activist types, I also enjoyed being part of those discussions and certainly learned a lot. Part of that lot was that somehow all the environmentally reasonable options seemed to be always trumped by lack of political will, which, in turn, was directly related to the economic sacrifices one needed to make or the bigger short-term gains that the environmentally disastrous options would offer. Klein’s book touches all this. I have actually had this book for quite a while but for some reason it has taken ages to read. Starting this blog and reading Holly’s article that mentioned Klein were the last motivators that I needed to finish it. 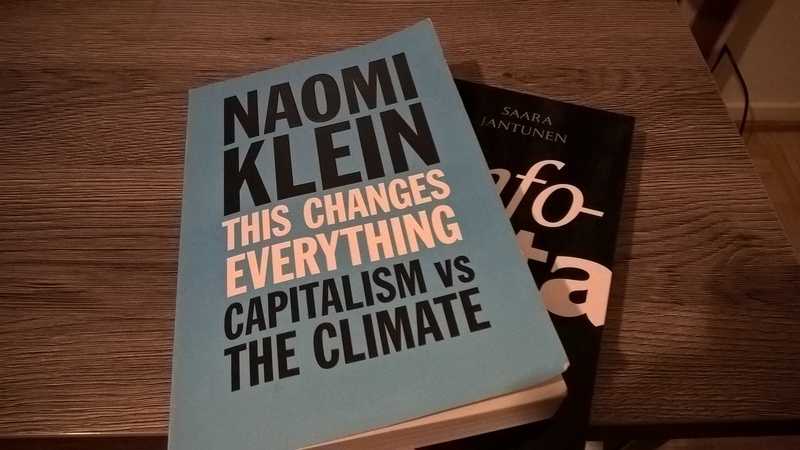 Anyway, Klein claims in the book that capitalism does not include mechanisms that would help us to avoid climate disaster – rather it is the driving force behind climate change – and that science will not save us. She quite convincingly manages to show that we are pretty much screwed and I tend to agree. In the end Klein does find some hope in the form of social movements that challenge the whole capitalist/extractivist form of thinking. A proof that I have at least seen these books that I’m talking about. It is here that I would love to agree with Klein but I tend to remain sceptical. In fact, it feels that the world moves exactly the opposite direction. At least in Australia and Finland – yes, this is not very representative but these are the governments that I mostly follow – the recent recession is used as an excuse to look towards mining industry and to forget the presumably costly green options. Climate change is acknowledged but halting it isn’t a priority in political decision-making. It would be wonderful if people would challenge the big corporations and aim for greener and more equal future. However, in societies where political left is more on the right than ever before, where populist nationalism is on the rise [and they don’t really care about the nature as long as there are refugees to be afraid of], and where the greens get at best 10% of the votes, it is hard to see any movement towards limiting exploitation of nature in any meaningful scale. While the underground environmental groups may win battles, they are not winning the war. Of course, this is where I would love to be wrong. The book ends with a suggestion that to survive the climate change, we should radically change our worldview from the earth-as-a-machine thinking to the earth-as-an-organic-whole thinking. Personally I don’t see these two as opposites. One could easily have an “engineer’s attitude” towards environment and agree that what we have is just a really complex system where tinkering with some parts (e.g. releasing fucktons of CO2 into atmosphere) can and will have bad effects from the point of view of the whole system. In other words, I don’t think that we need to radically change the way we see the world – especially if one talks about scientific point of view. What might need a change is our values and that can be enourmously difficult. People, me included, tend to like their Western lifestyle and if avoiding disastrous climate change requires radical change to that – even if we hold onto the scientific attitude towards nature -, it should be no surprise that we will act too little and probably too late. But do we really need a total change in lifestyle or merely alternative CO2-free energy sources? I have absolutely no idea. An optimist would say that as we have green energy options with an EROEI value that is high enough to sustain the Western lifestyle, all we need from the nature are the materials for our consumer goods. Is that too much asked? Probably, if we want everyone to be part of the middle class. Anyway, as a pessimist in this matter I am already waiting for the scarred Mad Max world where corporations fight over the dwindling resources with their private armies, just so that the few rich can still cling onto the luxurious lifestyle at the cost of everyone else.